Click on the image above to see a full-size version of the heights of Mozart, Beethoven et al in its full, towering glory. Huge choirs, massive orchestras and great music that spans the peaks and troughs of human emotion. Their pieces may be larger than life - but how tall were the great composers themselves? We couldn't resist a good old-fashioned line-up, comparing the smallest and the tallest of a few of our favourite composers. Rachmaninov's music is certainly at the pinnacle of Romantic piano repertoire, but how does he measure up to a composer like Chopin? And while Beethoven might have scaled new heights with his groundbreaking Symphony No. 9, his small stature is another story. 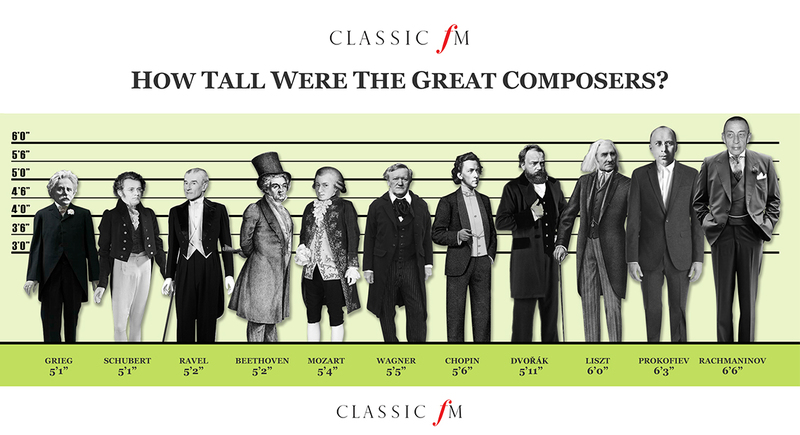 From miniature Mozart to long-legged Liszt, click on the image above to take a look at the smallest and tallest of the great composers.